I’m finally to the point that I’ve cleared out and colonized all the land left inside the garden. 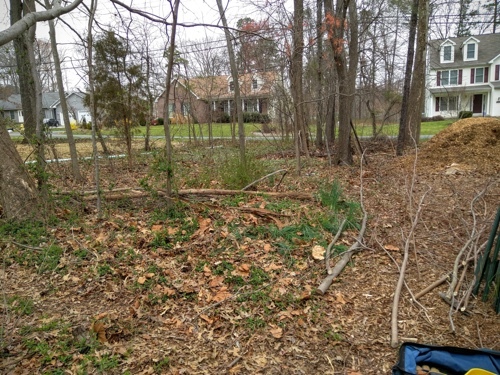 I want more room, specifically more room to grow perennials, and I’ve been eyeing the little strip north of the garden – maybe 1,000 sf or so – between the top of the garden and the road. Right now it’s just a spot where mulch and woodchips get dumped. It’s a problem area because it’s always soggy, wet and squishy; trucks get themselves mired and a few have even had to get towed out of there, the mud is so bad. BUT. I’ve been studying the water patterns in the woods for a few months now. It’s much easier to do since I’ve cleared out much of the brush – I have a clearer idea of the overall picture of how water gets onto the land and where it wants to go. In this particular corner, the problem isn’t the water table exactly like it is in other places. 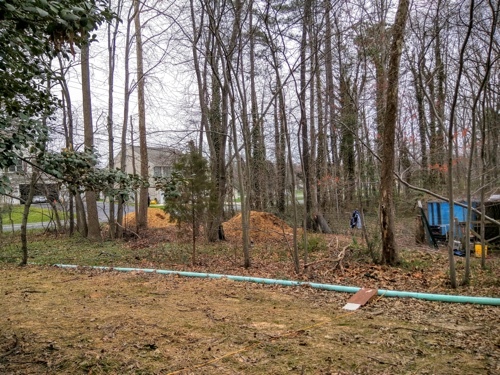 Located at the bottom of convergent slopes something like half a funnel, as well as the location of the output drain of our basement sump pump, this area is mostly a victim of rainwater runoff. I believe I might be able to channel that water by cutting in a creek or two with an excavator and leading them to a small pond further in from the road. This area is very young scrub growth/early succession forest, mostly. There are only three to four trees in it large enough that I wouldn’t try to cut them myself; the rest are all young saplings maybe 6″ in diameter and less. Red maple and wild non-fruiting cherry, both trash trees. All of them young enough that I feel no regret chopping them down to plant more useful species of trees, but also old enough and straight enough that I might be able to harvest some genuinely useful poles and such. The largest trees are so tall that they may not cast smothering shade on a young understory tree – in fact they might be useful as nurse trees to help shield the saplings as they grow. So they might be able to stay. The more diversity there is, the more resilient the soil food web. I want to use this space to plant a real permaculture food forest. They are also there running perpendicular to the slope of the land, to help prevent rainwater runoff from funneling down from the street into the garden. Let all that wasted rainwater soak into these wood compost sponges and nourish my trees and bushes instead. It doesn’t look like much, but you should have seen the size of the hugels before I topped them with the heavy wood chips. At least it is starting to look a tiny bit more organized. And look how many lovely, straight(ish), useful poles I harvested as well. These are certain to come in handy. I can’t wait to show it to you once I’ve gotten an actual chain saw – sometime this week, perhaps. While I feel bad chopping down trees – even little ones – I have to keep reminding myself that I’m replacing them with much more productive species. There will be nut trees, berry trees, nitrogen-fixing trees… ten each of 8 different varieties, to be exact. Oh yes. 80 trees. More on that in a later post. 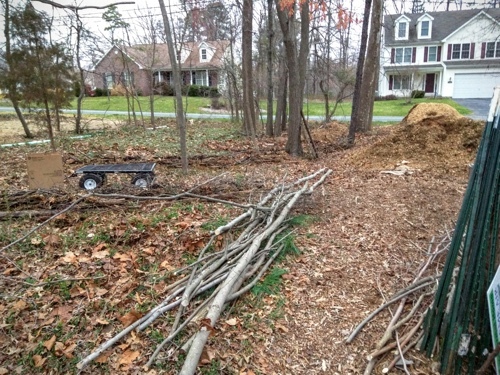 And in between the trees I am going to plant all kinds of woodland plants that thrive in the understory – blueberries, currants, blackberries, mulberries, elderberries; ramps perhaps, or ginseng; oh, the list goes on. There are so very many possibilities for woodland guild plantings. This little piece of land is perfectly positioned to take advantage of the chickens as a force for tillage, sanitation, and bug control. Chickens can wreak absolute havoc in a vegetable garden as they scratch up delicate annuals and tear them to pieces; but perennials are made of much hardier stuff. Chickens clean up dropped fruit, eat up any insect larvae that fall, preventing further generations, and can scratch in any heaps of mulch or compost that I leave lying about. If my rainwater-runoff-diversion-stream-pond idea works, I’m hoping to have some ducks running around in this paddock as well. I’m looking forward to staring out at this little piece of land in the Spring and seeing flowers everywhere for the first time. This entry was posted on Friday, April 1st, 2016 at 12:59 pm	and is filed under garden & farm, homesteading, before & after, building, design, permaculture. You can follow any responses to this entry through the RSS 2.0 feed. You can leave a response, or trackback from your own site.